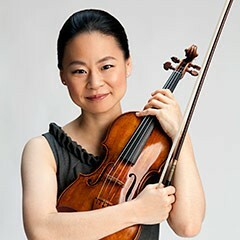 The violinist and educator Midori Goto has maintained an international presence for almost three decades, first as a performer, and increasingly as a musical community engagement advocate, and educator. She currently performs close to 100 concerts a year worldwide, leads varied community-involving and charitable projects, and serves on the violin faculty at the USC Thornton School of Music as a Judge Widney Professor of Music at USC. “It is an honor to teach. Learning begins when given information starts to be interpreted, executed, nurtured, and internalized, leading us to infinite opportunities.In our studio, the tenets of Honesty, Health, and Dignity guide us through the times of trial, self-doubt, self-questioning, and growth. The values of discipline and honesty find their way into perseverance in daily practice and in the diligent training of the ears, guiding us to approach any piece with humility and respect.